An isolated, rugged mass of brown sandstone rising abruptly from the expansive level prairie surrounding it still echos the legendary, "This is Pawnee Rock" a classic spot in the Indian history of the "Great Plains." 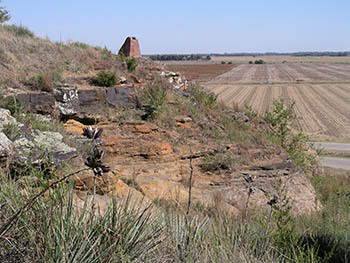 During the half century included from 1823-73, which latter date marked the advent of the railroad in this portion of Kansas, "Pawnee Rock" was the most dangerous place on all the Central Plains for encounters with Indians, for at that particular point on the great international "trail," the Pawnees, Kiowas, Arrapahoes and Cheyennes made their not infrequently successful raids upon the "pack" or wagon trains of freighters across the continent. Early in pioneer history when the Santa Fe Trail along with other routes were bringing westward bound travelers and ambitious settlers from the east to the western plains, bands of Indians had the vantage of ambushing the wagon trains from this outcrop of rock. A small village was trying to establish itself in the 1870s as a stop along the Santa Fe Trail. According to history, it wasn't until later during a 3 day stand off between the Pawnee Indians and a group of men including Kit Carson that the rock became known as Pawnee Rock. Subsequently, the town eventually claimed the name. The Santa Fe ruts are now obscure as faint reminders to landowners and visitors of a time gone by. The once little village is now a small rural town and remains in support of the Pawnee Rock State Park Historical Landmark. A tennis court and basketball court sit in the city park along Centre Street. Adjacent to the courts are a swingset and teeter-totter. In the summer, there might be a dance or two here. This is wide-open country with paved and packed-dirt roads to ride to your heart's content. The Arkansas River and Ash Creek used to be good for fishing, but that was before the river dried up. Now, look for farm ponds and sandpits for catfish and bass (get permission first). Cedar Bluff, Kanopolis, and Wilson reservoirs are a little more than an hour's drive away to the northwest and northeast. Pheasant, doves and deer are hunted in the fields and wooded areas. Turkeys and quail also live in the neighborhood.